Today, Australia is one of the best destinations for the experienced and qualified engineers in various branches from different parts of the world. They cherish the desire to live and work in the country of Australia as engineers in reputed companies. Most of the engineers think How to Get the Top Online CDR Report Writing Service? But in order to make their dream come true, they definitely need to qualify the CDR Report or the Competency Demonstration Report for this purpose. 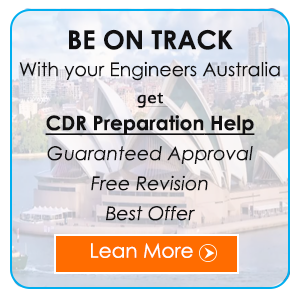 The CDR is assessed by an expert team known as the Engineers Australia (EA). They test how competent the foreign applicant is to work as an engineer in any company in Australia. Thus, it is always very much essential for you to write the CDR Report in the best possible way to get selected by the EA. You always need to follow the latest updated EA guidelines very carefully and keep yourself abreast with the EA official website. But it is tough for the overseas applicants to follow the EA guidelines so accurately. Thus, they definitely need the top standard online CDR Report Writing Service from a reliable provider. The CDR writing experts can guide you in the best way to get your application selected by the EA. How to Write a CDR Report? The 3 Career Episodes: It is a bit tricky for many engineers to write the 3 Career Episodes most of them are not aware of the exact technical requirements of the EA (Engineers Australia) and their recommended writing style. Each of these Career Episodes is in fact lengthy essays to show your own technical competencies to the EA assessors. Here you need to draft the essay and clarify how competent you are in your own engineering branch viz: electrical, mechanical, civil, IT, etc. Summary Statement: It needs to be one page long. It is perhaps the most important as well toughest part of your CDR. In a single page you need to showcase your engineering as well as managerial skills by drawing proper references from the Career Episodes, written by you earlier. Continuing Professional Development (CPD): This report is needed by the CDR Engineers Australia (EA) for the Migration Skilled Assessment. The CPD actually shows that the applicant engineer is really keeping himself updated with the latest developments in the engineering field. All the related CPDs are to be included in the CDR report. The CPD should be provided in a list format with certain information. This information includetraining title, training date, training duration, training venue, etc. Your updated CV: You always need to enclose your updated CV presented in an ideal manner with your CDR application. You also need to provide scans of all your qualification documents along with the application. If you follow the tips you can get your CDR selected by the EA. The CDR Sample Report Writing online service provided by Casestudyhelp.com can also help you a lot in this field.